Had to find a new way to do eggs this year since I forgot to buy vinegar for the traditional method...which for us would be different since we typically don't do traditional. If you are like me you have plenty of nail polish in the house to complete this nail polish dunking method. Grab the gloves and a disposable bowl. I got my idea from my sister who sent me this video from Athriftymom.com Check the great video out below. I had a little bit of a challenge with some polish. It was as if there polish would create a layer so if I tried to make lines with a toothpick it would just grab the paint. Even without using a toothpick to create lines and fun designs the project looked neat. Grab your gloves and nail polish! My kids could not enjoy this as much since the gloves are too big for their little fingers. 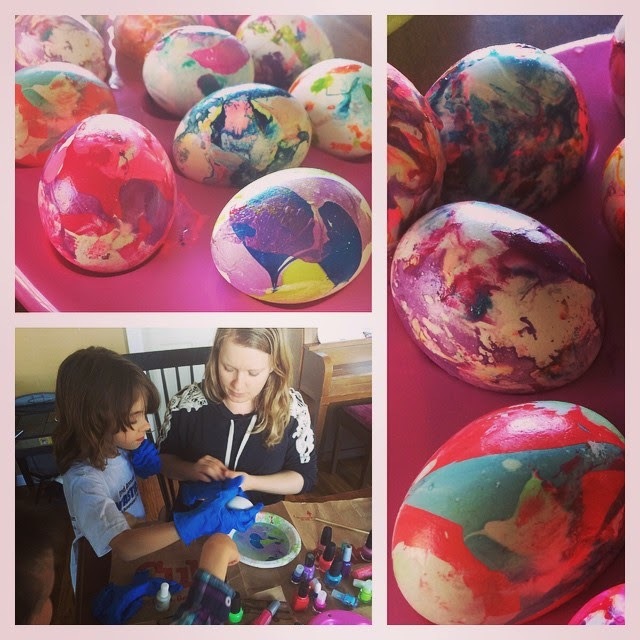 So they helped by picking color combinations and then applying stickers on the eggs once they were dry.